While we were at the beach in July, I went to Island Knits yarn shop in Pawley Island, South Carolina. And, yes, there was some stash enhancement. The black yarn in the first picture is VERY soft. 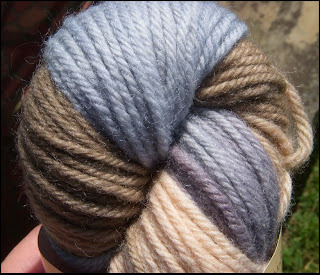 It is from the Plymouth Yarn Company and is called Buckingham. It is 80% Baby Alpaca and 20% Silk. I found it with her sock yarns, but I think it would also make a really pretty scarf, and in fact she gave me a free lace scarf pattern when I bought the yarn. The color number is 500. The next yarn is from the Ester Bitran yarn company and is called Talinay. It is a bulky weight wool yarn. She also gave me a scarf pattern with this one. I liked the model she had in the shop, so I'm anxious to crank out this scarf. It is color 220 -- tan, pink, blue and brown. It probably isn't a colorway that I would have chosen for myself, but I imagine it as a gift. 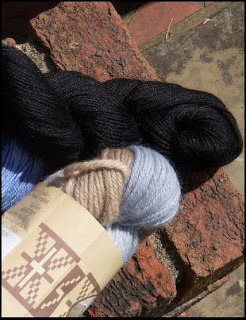 The third yarn is a sock yarn from Araucania Yarns called Itata Multy. It is 70% superwash wool, 15% silk and 15% bamboo. 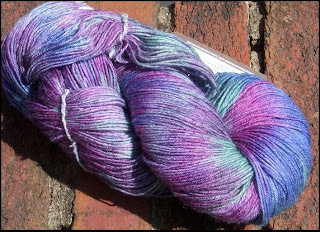 The colorway is 1002, and it is a mix of blue, purple and green. There are 430 yards in the skein.